1. texassharon.com Current news on fracking in Texas plus resources/links for surviving fracking. 2. http://insideclimatenews.org/fracking-eagle-ford-shale-big-oil-bad-air-texas-prairie Based on an eight month investigation, this report concentrates on air pollution from fracking the Eagle Ford Shale. Scroll to bottom of report for links to additional importanat reports. 6. Economics of Fracking - this important talk by Deborah Rogers shatters industry hype - details enormous economic costs to communities, environmental degradation, destruction of roads (NOT offset by taxes), lack of promised jobs, reserves vs actual production. She lives in the Dallas-Forth Worth area, the Barnett Shale, with up to 24 wellbores per pad site because the shale wells depleted so quickly that new wells had to be drilled continuously to maintain cash flow. DFW has over 2000 wells, 800,000 people, DFW air now more polluted than Houston! Barnett Shale was (originally) touted as being an economic powerhouse for the next 40 or 50 years - it actually lasted 6-7 years! Water permanently removed from the hydrological cycle due to injected chemicals and radioactive materials that come out of the formation. Shale gas exportation (we keep the pollution, other countries get the gas, our prices go up), first 8 permits alone have already committed 20% of US shale gas supply to overseas export. In another talk, she details recovery efficiences of conventional oil, 75-85% VS shale 4-10%(6.5% average)! plus crop damage from ozone in the $10-100 million range. Actions of industry show lack of confidence in actual production vs reserves. 7. Water Pollution - when a well casing failure occurs it is usually near the top, where the pressure from the slurry is the strongest, also where it is closest to the water table. The industry claims to protect the water with well casings lined in multiple layers of concrete and cement however these are two materials that corrode when in contact with water, and even more so when that water has a higher salinity. There is also a great deal of water contamination due to…carelessness… leaking flowback storage ponds, surface spills and illegal dumping of flowback fluid. Source: p 34, Shalefield Stories - Personal and Collected Testimonies, published by Steel Valley Printers, January 2014; For information specific to TEXAS see pp 17-19, 25, 34. “There are three different types of wells in the Eagle Ford Shale development included in the emission inventory: dry gas wells, wet gas wells that produce condensate, and oil wells that can also produce casinghead gas. Hydrocarbons are released in the Eagle Ford Shale during five main phases of well construction and production: exploration and pad construction, drilling operation, hydraulic fracturing and completion operation, production, and midstream sources. Emissions sources include drill rigs, compressors, pumps, heaters, other non-road equipment, process emissions, flares, storage tanks, fugitive, and on-road. 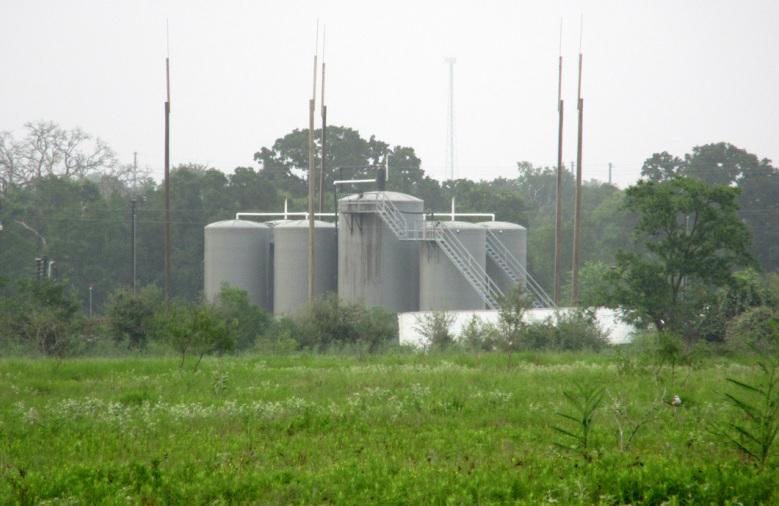 Production in the Eagle Ford emitted an estimated 66 tons of NOX and 101 tons of VOCs per ozone season day in 2011. For the 2012 photochemical model projection year, emissions increased to 111 tons of NOX and 229 tons of VOCs per ozone season day. To estimate emissions for 2018, calculations were based on three potential levels of development. NOX emissions increase slightly for the low development scenario in 2018 (113 tons per day). NOX emissions also increase under the 2018 moderate scenario (146 tons per day) and the high scenario (188 tons per day). By 2018, VOC emissions are expected to increase significantly to 338 tons per ozone season day under the low development scenario and to 872 tons per ozone season day under the high development scenario. “Perforating is simply the use of a tube equipped with charges to perforate the well casing. Once a section is perforated it is then plugged to increase the effectiveness of the next stage of the hydraulic fracturing. Perforating and plugging are conducted using the large 200 ton crane hooked up to a slickline, which is a long pipe that is used to lubricate the perforating gun and plug. The perforating gun consists of several smaller guns (or charge sections). The number of guns is well dependent…. See Table 9-3 for estimated air pollution levels in Brazos County. The Railroad Commission regulates the exploration and production of oil and natural gas in Texas. The Commission’s primary responsibilities include: preventing waste of oil and gas resources; protection of surface and subsurface water; and, ensuring all mineral interest owners have an opportunity to develop their fair share of the minerals underlying their property. The Railroad Commission does not have jurisdiction over roads, traffic, noise, odors, leases, pipeline easements, or royalty payments. Roads and Traffic: The Railroad Commission does not have jurisdiction over, and exercises no regulatory authority with respect to, private or public roads or road use. Permits issued by the Commission for oil and gas exploration, production, and waste disposal do not limit any independent authority of a municipality, county or other state agencies with respect to road use. The Texas Department of Transportation oversees the construction and maintenance of state highways within their jurisdiction. In addition, TXDOT is responsible for issuing access permits to well sites from a roadway on the state highway system. Noise: The Commission has no statutory authority over noise or nuisance related issues. Noise and nuisance related issues would be governed by local ordinances. Odors and Air Contaminants: The Railroad Commission does not have regulatory authority over odors or air contaminants. However, for a well within the city limits, the city may enact ordinances regarding odors or other nuisances. In addition, the Texas Commission on Environmental Quality (TCEQ) has jurisdiction over odor and air contaminants. Please see http://www.tceq.state.tx.us/compliance/complaints/odor_complaint.html. 14. We get our water from the Carrizo-Wilcox Aquifer, an aquifer that also sits below several other counties where numerous oil and gas wells have been, or will be, fracked. What tests, forecasts, and projections are being done to ensure the quality and quantity of water in our aquifer is protected? Scattered across the oil and gas fields of Texas there are at least 7,869 abandoned wells. The Texas Railroad Commission (RRC) which regulates drilling calls them orphans. By the RRC’s count, there are an additional 5,445 wells that are inactive and whose operators are delinquent in meeting regulations. Add to all that an unknown number of orphan wells drilled decades ago for which records have been lost, if they ever existed. A study prepared in 2011 for the Ground Water Protection Council based in Oklahoma cited 30 episodes from 1993 to 2008 of orphaned wells or abandoned drilling sites’ polluting groundwater in Texas. The Railroad Commission estimates that two to three cases of groundwater contamination have been caused by abandoned wells since 2008, said Ramona Nye, a commission spokeswoman. Some say hydraulic fracturing, or fracking, the process of breaking up oil or gas-rich rock by blasting water, sand and chemicals, has created additional concerns about the abandoned wells. Underground disposal wells, which are used to store wastewater from fracking operations, are another source of concern. The Railroad Commission requires that disposal well operators survey a quarter-mile radius around their site for non-plugged wells to ensure that pollution will not have a pathway to the surface. Ed Walker, the general manager of the Wintergarden Groundwater Conservation District in South Texas, said that a few years ago, water came up out of an abandoned 1940s-era well that lay slightly more than a quarter-mile from a disposal well.Plugging old wells is expensive, and costs have risen as the oil industry gets busier, said Debbra Hastings, executive vice president of the Texas Oil and Gas Association. Last month, the three railroad commissioners approved contracts for plugging wells that ranged from $30,000 per well, in Liberty County, east of Houston, to $128,000 per well, in Jim Hogg and Webb counties in South Texas. Plugging abandoned wells sitting in shallow water — a priority of the commission, Craddick said — is costlier still, and can require scuba divers and barges. In the 2012 fiscal year, the Railroad Commission spent more than $170,000 apiece to plug a dozen of those wells. •	Bad casing jobs, allowing frack fluids to seep into the ground and shallow aquifers! •	Throwing frack fluids in unlined pits, even over aquifers! •	Not recycling as much frack fluids as is now possible, to save our precious drinking water. •	Tearing up roads and not paying for the damage. •	Denying there is a problem with air pollution. •	Denying open records to the public by using private rather than public universities for study. •	Denying that there is any a problem whatsoever! "...A typical early fracture took 750 gallons of fluid (water, gelled crude oil, or gelled kerosene) and 400 lbm of sand. By contrast, modern methods can use up to 8 million gallons of water and 75,000 to 320,000 pounds of sand. Fracking fluids can take the form of foams, gels, or slickwater combinations and often include benzene, hydrochloric acid, friction reducers, guar gum, biocides, and diesel fuel. Likewise, the hydraulic horsepower (hhp) needed to pump fracking material has risen from an average of about 75 hhp in the early days to an average of more than 1,500 hhp today, with big jobs requiring more than 10,000 hhp. Fracking’s new golden age began in 2003, as oil and gas producers began to explore the nation’s massive shale formations in earnest. " Also, note the number of permits issued by RRC since 2008 in Eagle Ford. If fracking hasn’t changed, why the huge increase in permits and why wasn’t this area fracked much earlier when the price of oil was higher? Why did they lobby for exemptions to key provisions of federal clean air and water legislation? This is not your grandfather’s fracking. This in not the same old technology.